A friend invited me to join her Mormon moms workout group that meets on Monday and Friday mornings, and I went today for the first time. Apparently Mormons like to go uphill really fast and leave Presbyterians like me with poor cardiovascular conditioning in the dust. Then they do a bunch of pilates before doing it all over again (somehow finding a way to go uphill both ways). Then, to spite me, Nike+ didn’t synch all my data and now I’ve been robbed of getting Nike Fuel points for a game that I don’t understand. For this I deserve to eat. I buy the langoustines from Costco, and they’re already cooked and frozen so I just thaw them in a mesh strainer. I’m sure I’m supposed to say that you should do this in the refrigerator but that’s not what I did. Oh, and langoustines are basically really small lobsters. I was going to link to a picture but I think it’s best not to see what they look like before you’re going to eat them. Once your langoustines are defrosted, chop up some garlic and tomatoes and heat up your olive oil, on medium to low. You’ll want to put the garlic in there to cook for about a minute, so that they just start to look slightly golden but don’t burn. Try not to salivate into the pan. 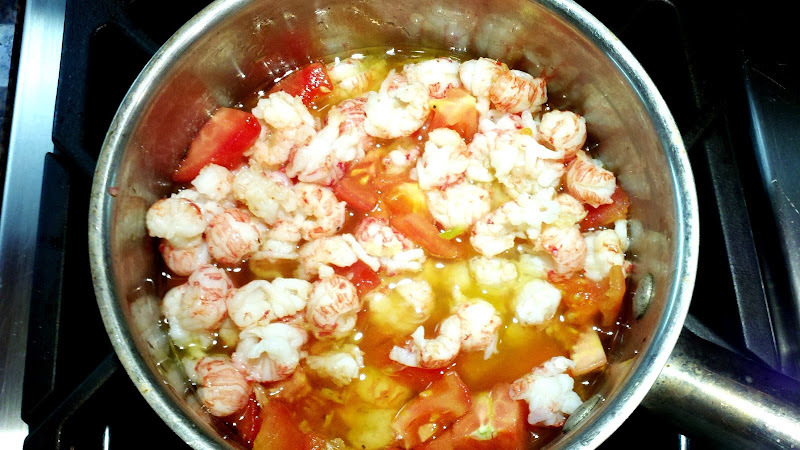 Turn off the heat and add in the tomatoes and langoustine, stirring. Add salt and pepper. If you want it to taste even better, add in a half of a dried red chili pepper while the garlic is cooking. The pepper seeps into the oil slowly and gives it a nice, warm, rich flavor. Cover and let it sit for a bit for the flavors to meld. While you’re waiting, boil the linguine. Drain, toss the sauce with the linguine, garnish with parsley, and eat those carbs. You deserve it! Heat oil in a saute pan over medium to low heat. Add in garlic (and optionally, the chili pepper) and cook for about a minute, til it begins to be a very light golden hue. (For a milder spice, substitute paprika for the chili pepper.) Off the heat, and stir in tomatoes, langoustine, salt and pepper. Cover to allow flavors to meld. Boil the linguine and drain. Combine with prepared sauce above, stir in parsley and serve. Posted on February 3, 2012 by Sandi. This entry was posted in Cooking, Food and tagged garlic, langoustines, linguine, parsley, pasta, recipes, tomato. Bookmark the permalink. YUM. I love how fancy this is and yet seems so simple. Thanks for sharing! And cracked up reading it, of course. I adore B.C. And she would say that. And I bet she’d say this about your dish, too. Thanks Danielle! It really is easy — like most things I do! Looks so delicious! My husband would LOVE this! Thanks for stopping by, Jill! I actually just made your Celebration Cake — all the parts except the filling, since I’m still a beginner — it was delicious! I’ll update this post but another alternative I’ve tried in this recipe is to use paprika instead of a red chili, for a milder flavor — I do that when I serve it to the kids. It looks delicious, especially for entertaining! I’ll bet a 1/4 cup of white wine would be good in there as well. Cooked off just before you add the langoustines. Thanks Terri — I agree, white wine would be a delicious addition! I’ll try that next time! Thanks for stopping by. Chris, that sounds fantastic! I couldn’t view the photo but ANYTHING with truffle oil on it is pure heaven. Thanks for stopping by!